I’m liking these Java Jive mysteries! Juliet Langley is a manager at a local coffee-house, Java Jive. She works for her long-time friend, Pete Bennett. At one time, Juliet wanted to be a singer, but a bad case of stage fright has put that passion to rest, though she still enjoys playing her guitar and singing once in a while … as long as no one is around to listen. Juliet is in a relationship with Ryder Hamilton, a local detective. Their relationship hasn’t been the smoothest, but right now things seem to be good. Then Ryder tells Juliet that he’s been promoted to the homicide division and his partner is the cranky detective who’s been on Juliet’s case since she first discovered a dead body (Death Before Decaf). Now, a college student has gone missing and all of Nashville is concerned. When Juliet discovers the student’s dead body, everything goes from bad to worse. Add to this that her relationship with Ryder is getting more stressed, and then one of her employees goes missing and Juliet is completely on edge. Author Caroline Fardig has created a really fun, believable set of characters. Juliet is a young woman who female readers can likely identify with and male readers want to meet. Ryder and Pete seem to be competing for Juliet’s attention and depending on her mood (and how Fardig manipulates us [and I use the term affectionately and in the best possible way]). This is some pretty light reading, and yet the mysteries are real solid and so far all involve a murder. I’ve seen many people refer to this series as a ‘Cozy Mystery’ series. There are many ways in which this fits the bill, but it seems just a little stronger, a little deeper than most of the other ‘cozies’ that I’ve read. In many ways, this is more a series about Juliet Langley, modern single woman who happens to get involved in some murder investigations, than about Juliet Langley, amateur sleuth. I will pick up a Java Jive mystery any time, any where. You should too! Looking for a good book? 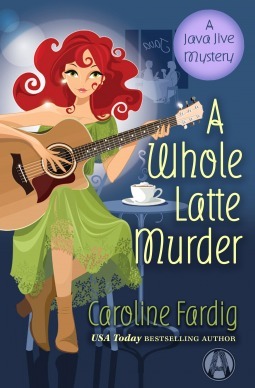 A Whole Latte Murder by Caroline Fardig is the third book in the Java Jive Mystery series and continues to deliver a well-written, interesting mystery with great characters.